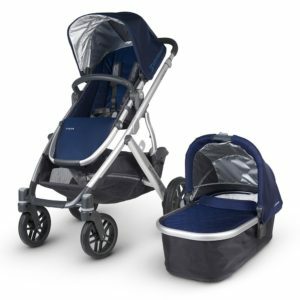 Valco Baby has been producing baby products in Australia for over 30 years and has recently started selling their baby strollers in the USA. 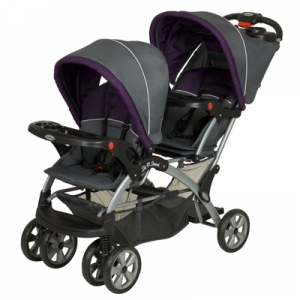 The Valco Matrix is a three wheel, all terrain stroller that is very maneuverable. It retails for approximately $375. It is easy to steer and will suit newborns. 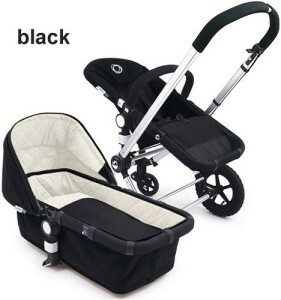 There is a large range of accessories available for this stroller. Folding is a little more difficult than other strollers. This stroller can handle most types of surface. It is available in three colors: black, grey and taupe. 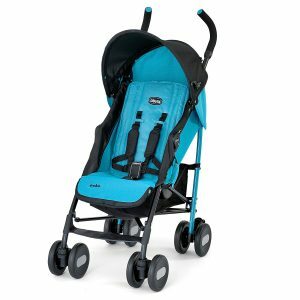 It seems to be a cheaper version of Valco Baby’s all terrain range and the price is good for the performance. Even though the Matrix has large, air filled wheels, it is surprisingly easy to push and to steer. This is not normally the case with large wheels. It performs really well on paved surfaces. We took it on our uncles gravel driveway which has a lot of holes in it but with the front wheel locked, we had no problem pushing it. This is not the easiest stroller to fold and we really would have liked an automatic lock when folding but there is a strap to keep it secure. The fold requires both hands. It can be folded even if the optional Joey seat is attached. 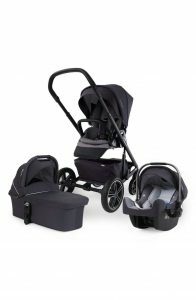 It is quite a large stroller when folded (larger than the Valco Baby Tri Mode Stroller). The seat material is easy to wipe clean and is durable. The outer fabric is breathable. There is a five point harness and this has had reflective strips added to it which really makes it visible at night. The seat has the standard Valco footrest made of metal. This is rugged, easy to clean and comfortable for children. The seat has a one had recline and can be set totally flat or almost vertical and anywhere in between. Adapters are available for car seats. There are adapters for Graco, Maxi Cosi, Britax and Peg Perego car seats. There is a toddler seat available “Joey seat” but this was not attached to our stroller. We did not use a bassinet. 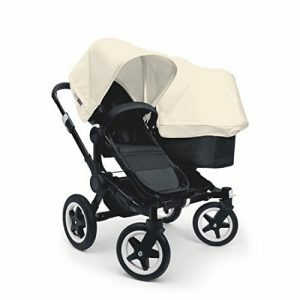 The canopy is large and like the Valco Baby Tri-Mode, it has a zippered extension that works well. However, any adjustment to the canopy is noisy and can wake your baby. Like the safety harness, the canopy has reflective piping attached to improve visibility at night. The canopy has a “Peek-a-boo” window. The shopping basket is very small (15″ x 11″ x 8″). In fact it one of the smallest that I have ever used and certainly will not be suitable for many parents. Once I had my diaper bag in it, there was very little room for anything else. So make sure you check this before you buy. There is a storage pocket on the back of the seat and this is very handy for pocket items like cell phones etc. This is very useful when travelling over rough surfaces as it prevents the front wheel from digging into ruts. All of the wheels are very easy to remove if you need more space in the trunk. A hand pump is included with the stroller in a separate pouch should you need to pump up a tire. The handlebar has a tether strap and this is a valuable safety feature. Thankfully it is adjustable for height and will accommodate all but the shortest or tallest people. The Valco Baby Matrix easily grows with your family. I can be converted into a double and even carry a third, standing child. It is stylish and well built and will handle most types of terrain with ease. The seat reclines fully and it can easily and comfortably carry newborns. If you are looking for a very maneuverable, all terrain stroller for less than $400, then this may be the stroller for you. Overall, I think that it looks terrific and that it is good value for money.